This publication originally featured on National Defense University’s Joint Forces Quarterly and is republished with permission. It may be read in its original form here. At a time when global instability and uncertainty are undeniable, the demand for astute American global strategic leadership is greater than ever. Unfortunately, tactical superficiality and parochial policies of convenience are undermining joint strategic leader development and the ability to operate effectively around the world.1 Tactical supremacy and the lack of a peer competitor have contributed to strategic thinking becoming a lost art. This critical shortfall has been recognized for a number of years. General Anthony Zinni, USMC (Ret. ), and Tony Koltz stated in their 2009 book Leading the Charge that leaders today have no vision and consequently have “lost the ability to look and plan ahead.”2 Trapped within rigid bureaucracies, today’s joint strategic leaders immerse themselves in current operations, reacting to, rather than shaping, future events. Obviously, there is a recognized strategic leadership gap across multiple disciplines, but how to remedy that shortfall has eluded both trainers and educators. The only certainty is that strategic leader development remains entrenched within the same development processes that are falling well short of the desired outcome. In an attempt to change this legacy thinking, General Martin Dempsey, USA, during his last 2 years as Chairman of the Joint Chiefs, issued white papers on mission command, the profession of arms, and joint education, as well as a memorandum on desired leader attributes. Each of these documents highlighted this shortfall in strategic leadership in some form.5 The then-Chairman’s direction, however, failed to change the approach to leader development in any meaningful way. 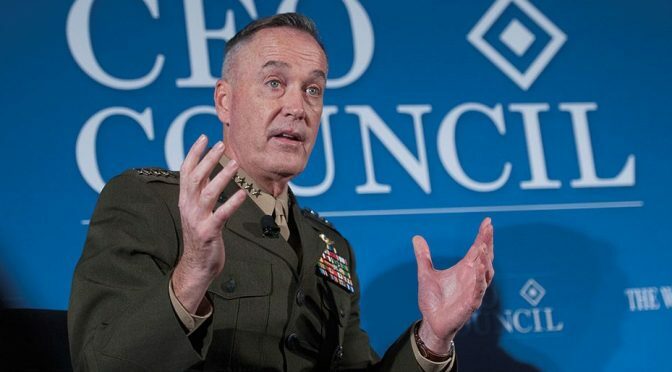 Instead of designing a strategic leadership program to meet the demands of the 21st century, the military community continues to embrace the outdated practices of the past. To rediscover the art of strategic thinking and planning, joint strategic leader development must disconnect itself from the paradigm of the past in which outcomes are known, risk is certain and manageable, and linear thinking is the norm. In its place, a developmental paradigm that embraces the discomforts of ambiguity, uncertainty, and complexity must be adopted. Modifying the training adage that the joint force must train the way it will fight, joint strategic leader development must reflect the realities of the global environment within which strategic decisionmaking occurs. Specifically, the joint force must develop strategic thinking competencies that will prepare strategic leaders for the ambiguities, uncertainties, and complexities of the 21st-century global security environment. These five reasons demand that joint officers develop a level of understanding not previously required from a national security perspective or demanded of them individually. This newly required depth and breadth of understanding entail the development of a perspective that encompasses longer periods of time—not only the present and near future, but also the distant past as well as the distant future. 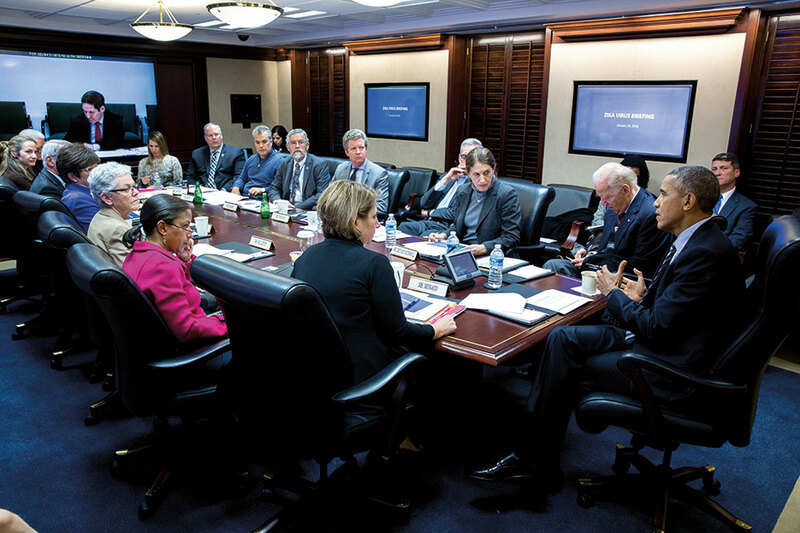 By drawing on an understanding of the past, joint strategic leaders can build a realistic vision that pulls joint organizations through the challenges of the present while positioning the Nation for future success. Without a vision of the future, the joint force is at a distinct disadvantage, as it will be caught unaware of developing trends, policies, and potential adversaries. 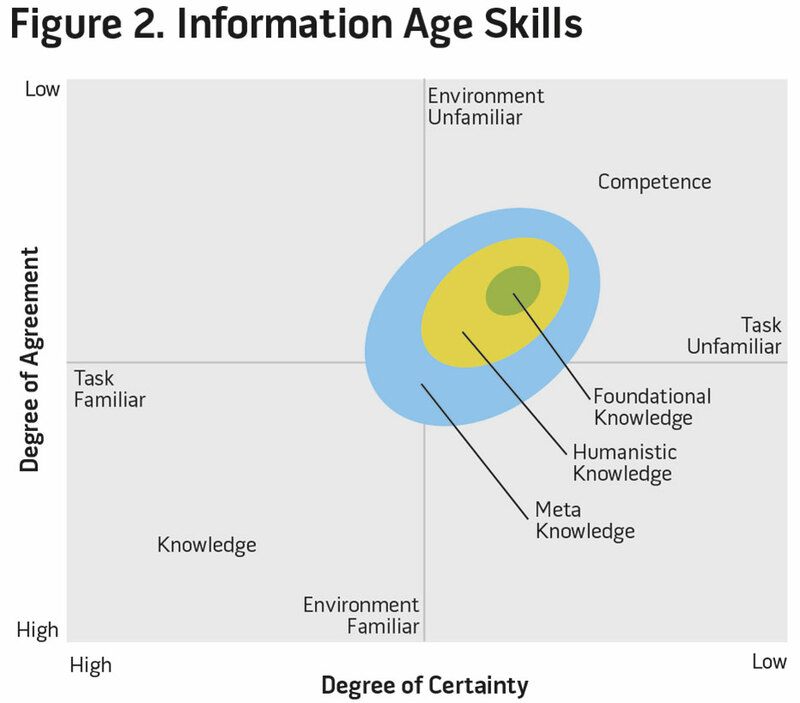 Figure 2 illustrates the transposition of skills needed in the information age. Again, generally speaking, the strategic operating environment has expanded to include regions for which the United States has little or no expertise, with tasks becoming increasingly unfamiliar. As the degrees of certainty and expert agreement have decreased, the need for domain-specific foundational knowledge has significantly diminished. In the information age, meta- and humanistic knowledge come to the fore as the need to address the dynamics of integrated domains and multiple cultural perspectives increases. Specific foundational knowledge is decreased proportionally because collaborative approaches can potentially develop multiple solutions needed to address the complexities of integrated security domains. Given the skills required of strategic leaders in the information age, it is necessary to undertake a short review of Service and joint leadership development and doctrine to identify the current strategic leadership shortfall. As expected, the Services do an excellent job describing leadership at multiple command levels. For example, Army Doctrine Publication 6-22, Army Leadership,10 and the Air Force’s Core Doctrine, Vol. 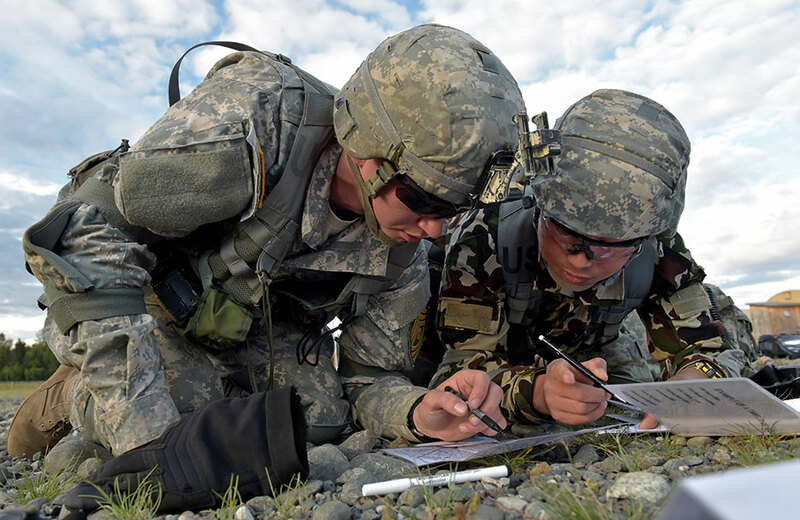 II, Leadership,11 provide definitions, purpose, competencies, and attributes required by leaders for conducting warfighting. Service leadership clearly formed the bedrock of American tactical and operational successes for many decades. Examining this framework, two issues become readily evident. First, the definition of joint leadership is missing. Second, the competencies as described in joint doctrine focus primarily on the tactical and low operational levels of war and fail to address strategic leadership in any form. Unfortunately, each of these missing pieces reinforces a tactical perspective of leadership at all echelons. Joint doctrine appears to assume that Service leadership development is adequate for strategic leadership despite recent evidence to the contrary. As General Dempsey and others have noted, the required leadership skills can vary broadly depending on the level of operations. For example, most joint officers are familiar with their Services’ roles and missions, having spent the majority of their careers in the tactical environment. This familiarity generally includes the types of organizations (for example, JTFs and components) and processes (for example, troop-leading procedures and the air-tasking cycle). At this level, complexity is limited because most interaction is at the individual or small group level, with decisionmaking measured in seconds, minutes, hours, or a few days. The operational level of leadership expands complexity to include multiple organizations and the proliferation of the number and types of processes and products used. Reflecting this increased complexity, combatant commands operate at a different speed of decisionmaking to incorporate increased stakeholder views and desires. Combatant command regional and functional strategies and plans are complicated further by the needs of the individuals and organizations at the tactical level. The strategic level of leadership expands complexity to include the defense enterprise decisionmakers, such as the Secretary of Defense and Chairman. At this level, specific processes reduce in number, but the numbers of stakeholders, including allies and partners, increase across a broader range of domains, such as the economic and domestic domains. Decisionmaking can lengthen to months, years, or even decades. Finally, at the national strategic level, decisionmakers such as the President must deal with global complexity that involves decisions spanning the time range of each of the lower levels—seconds, days, months, and years. Wherever one resides in an organization—whether at the tactical, operational, or strategic level, or some level in between—different leadership paradigms exist. To meet strategic leadership demands, the joint community must develop strategic thinking competencies. Strategic thinking is a cognitive process used to design and sustain an organization’s competitive advantage.17 It is a holistic method that leverages hindsight, insight, and foresight, and precedes strategy or plan development. Strategic thinking relies on an intuitive, visual, and creative process that explores the global security environment to synthesize emerging patterns, issues, connections, and opportunities.18Developing strategic thinking skills or competencies fills the strategic leadership shortfall while incorporating the desired leadership attributes identified by General Dempsey. Joint leader development thus becomes the vehicle that transitions the outdated military educational paradigm of the industrial age into one that serves the realities of the current information age environment. Cultivating these strategic thinking competencies can provide current and future strategic leaders with the skills necessary to develop and execute strategies and plans successfully. The first competency, critical thinking, provides joint strategic leaders with a depth and breadth of understanding that leverage hindsight, insight, and foresight. Insight represents the ability to analyze a thing and break it apart to see how its individual components are related and work together. By breaking a thing down into its component parts, elements and relationships not usually visible or understood are exposed. To gain an appreciation of a system’s current state, the past, including the environmental dynamics responsible for system creation, must be understood. The continued interplay of these dynamics provides additional system insights and aids in the development of foresight. Trend extrapolation provides strategic leaders with a temporal bridge between the past and present to the future. This extrapolation of both environmental change and constants aids joint strategic leaders in developing an understanding of what may lie ahead and in anticipating future events and subsequent plan development.20 Understanding the possible, plausible, and probable futures of a system aids strategic leaders in shaping the current conditions into those that are more preferable. Visual thinking engages the unconscious mind23 and is vital in problem-solving and modeling systems, especially ill-structured problems.24 Visual thinking allows for the processing of enormous amounts of information across multiple dimensions,25 adds clarity to communication, more fully engages group members, and enhances memory.26 Visual thinking assists joint strategic leaders by increasing their ability to recognize patterns and similarities and to see formal and informal relationships. 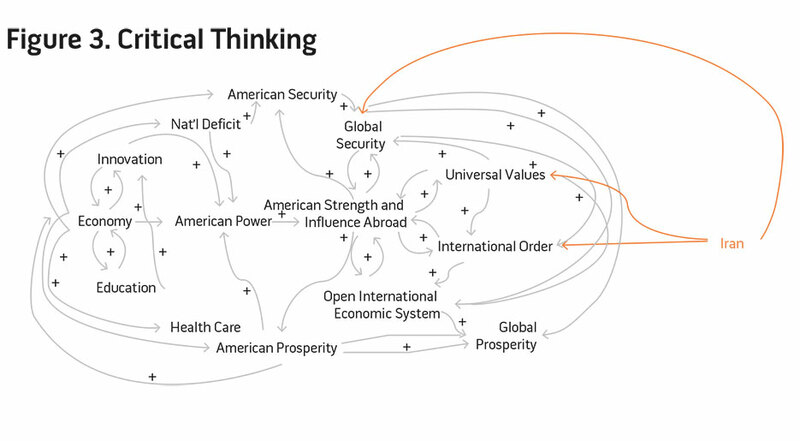 An example of critical thinking that leverages systems and visual thinking is the international security challenge the United States faces with Iran. Critical thinking requires the strategic leader to undertake a historical analysis of the two countries to develop an understanding of the current grievances between them. 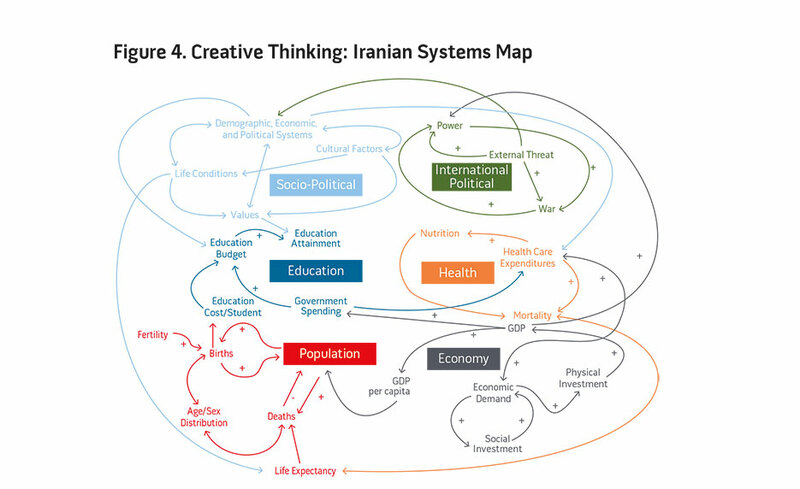 A systems map, leveraging visual thinking, helps to illustrate the current U.S. national security system and how Iran is undermining it (see figure 3). National security interests and the intensity of those interests, along with key leverage elements, could be identified using a systems map. In addition, possible strategies or approaches to limiting Iranian influence are more easily identified, together with the associated first-, second-, and third-order effects. Systems and visual thinking enhance joint strategic leader critical thinking by portraying system complexity and interrelationships in ways that simple narratives or discussion cannot. Solving globally complex security problems is the raison d’état of joint strategic leaders; unfortunately, finding enduring solutions is frustratingly elusive. Why is that? Typically, the same assumptions that created the problem continue to frame any potential approaches to solving it. As assumptions are the personal or organizational perceptual bedrock used to develop and sustain views of reality, the second strategic thinking competency, creative thinking, is needed to overcome this flawed perception. Creative thinking forces joint strategic leaders to challenge underlying assumptions, look for system patterns, view relationships and actors in new ways, take more risks, and leverage opportunities. Creative thinking uses the critical thinking tools of systems thinking and visual thinking to expose preexisting paradigms and develop new paradigms for developing and integrating new perspectives. Joint strategic leaders who can represent problems in as many ways as possible will ultimately achieve higher rates of success. Systems and visual thinking tools enable joint strategic leaders to develop different perspectives of an opposing system. For example, creating a depiction of the Iranian socopolitical system might provide the strategic leader with new insights into why current policies or operations are not creating the desired results. Systems and visualization tools are particularly effective for gaining insights into complex, adaptive systems (see figure 4). Creative thinking leverages primarily critical and collaborative thinking. For example, in a typical military context, there is often a failure to differentiate between the strategic, operational, and tactical levels of war when discussing an issue. As we know, stakeholders and problems change depending on perspective. There are a number of questions that can be used to help frame context. What is the history of the issue? What was the strategic political and social context? Who were the actors? What was the central issue? What were the surrounding issues? Contextual thinking frames a point of common understanding for all stakeholders and participants. It leverages critical, creative, and conceptual thinking. When dealing with complex problems, conceptual thinking helps joint strategic leaders illustrate interrelationships, facilitating much-needed discourse. Complex systems must be conceptually simplified to make them understandable.30 Conceptual thinking requires joint strategic leaders to be open to new ways of viewing the world, with a willingness to explore issues through alternative disciplines. Conceptual thinkers can effectively translate abstract thoughts to unfamiliar audiences. Conceptual thinking leverages critical, creative, contextual, and communicative thinking competencies. The fifth strategic thinking competency is collaborative thinking, which creates synergy, improves performance, and motivates people to learn, develop, share, and adapt to changes. Collaborative thinking assists joint strategic leaders in developing synergy from stakeholders by openly sharing knowledge and experience, while acknowledging and affirming the same in others. Mutual sharing, respect, diversity, and equal participation that occur through high-order social learning, thinking, and communicating characterize collaborative groups.31 Collaborative communication is the foundation of effective engagement, peak performance, and innovative outcomes; more importantly, it helps to develop and achieve common goals across national and institutional boundaries. In today’s global security environment, the joint force cannot claim expertise across the globe. Rather, joint strategic leaders must integrate stakeholders’ deep understanding of their environments to find a heightened level of perception and new ways to think about issues. Collaborative thinking directly enhances critical and creative thinking and is influenced by cultural and communicative thinking competencies. Cultural thinking, the sixth strategic thinking competency, is used to understand the interconnected world, incongruence of national borders, and synthesis of perspectives across a broad spectrum of cultures. Cultural thinking enables joint strategic leaders to understand a wider range of views and the beliefs, norms, values, and rituals associated with the global security environment. Enabled by information technology, the post–Cold War security environment collapsed into an intrinsically connected economic, cultural, and security global village. This interconnected world requires joint strategic leaders to understand that today’s security environment is not only multipolar but also exhibits characteristics of cross-pollinated perspectives, ideologies, goals, and capabilities. Within this global village, the costs of individual action have been intensified, with potentially substantial implications for the international security community. This new security reality has created a different ideological context that calls for international security responsibilities that go beyond individuals and nation-states.32 Joint strategic leaders regularly face tough ethical challenges because of various cultural factors. The greater the complexity of the environment within which the joint force is operating, the greater potential there is for ethical problems or misunderstandings to exist. As joint strategic leaders become ethically attuned, they must learn to view the world through a variety of lenses, developing a personal sense of right and wrong, and to interpret the influences that affect individual and group behavior.33 Cultural thinking leverages critical, collaborative, and communicative thinking. The last strategic thinking competency is communicative thinking. Communicative thinking is used by joint strategic leaders to understand the various means and modes of communicating, as well as the challenges associated with communicating complex issues among individuals, organizations, societies, cultures, and nations. A strategic leader must be able to build a desired, shared vision for the organization and communicate that vision internally and externally to various audiences. Joint strategic leaders must conceptualize complex issues and processes, simplify them, and inspire people around them. In today’s multicultural world, strategic leaders must be able to communicate across cultures as easily as they can communicate internally. Joint strategic leaders must understand the cultural nuances of communication and be capable of communicating using multiple modes and methods, including blogs, tweets, written and oral reports, videos, storyboards, PowerPoint presentations, and formal and informal sessions. They must also be aware that communication occurs continuously and that it can occur nonverbally and through inactivity. Joint strategic leaders must understand that communication is a filtered, continuous, and active process and cannot be undone.34 Communicative thinking leverages critical, collaborative, and cultural thinking competencies. 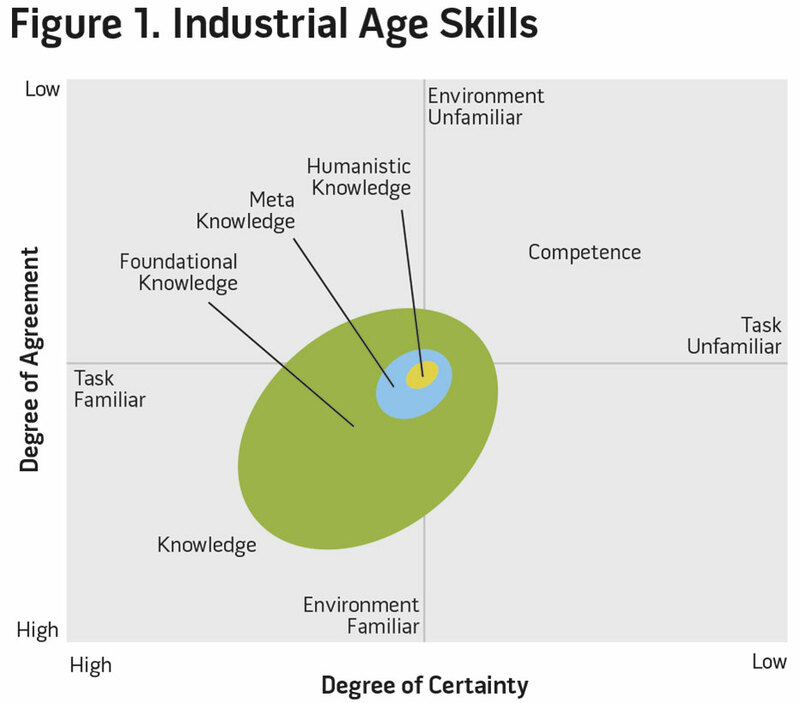 In the slower moving world of the industrial age, joint strategic leaders could plod their way through familiar tasks and concepts, developing solutions to a level of certainty most experts could agree on. In the fast-moving interconnected global security environment of today, however, strategic leaders do not have the luxury of time, task familiarity, or certainty. As a result, strategic leader competencies are needed more than ever. The difference between strategic leadership and “regular” leadership is that a strategic leader’s responsibilities are far broader and deeper in scope. These responsibilities typically cross not only functions and domains, but also often encompass multiple organizations that have diverse roles and responsibilities. The interactive process of leveraging unique stakeholder capabilities in the pursuit of common and enduring national, partner, and alliance security needs by identifying and communicating the goals and objectives of cooperative and willing stakeholders, and influencing their attainment. As Zinni and Koltz state in their book, the joint force needs officers who possess the requisite strategic thinking competencies demanded by both the current and the future global security environments.35 Current joint doctrine focuses on the low operational and tactical levels of war, and is insufficient for the development of joint strategic leaders. Dr. Daniel H. McCauley is an Assistant Professor at the Joint Forces Staff College in Norfolk, Virginia. 1 Jason Katz, “America’s Lack of Leadership Is Feeding Global Instability,” Congress Blog, September 18, 2014, available at <http://thehill.com/blogs/congress-blog/foreign-policy/217930-americas-lack-of-leadership-is-feeding-global-instability>. 2 Tony Zinni and Tony Koltz, Leading the Charge: Leadership Lessons from the Battlefield to the Boardroom (New York: Palgrave Macmillan, 2009), 28. 3 James Creelman et al., 2014 Global State of Strategy and Leadership Survey Report (New York: Palladium Group, Inc., 2014), 8, 18. 5 Martin E. Dempsey, America’s Military—A Profession of Arms, White Paper (Washington, DC: The Joint Staff, 2012); Mission Command, White Paper (Washington, DC: The Joint Staff, 2012); Joint Education, White Paper (Washington, DC: The Joint Staff, 2012); Desired Leader Attributes for Joint Force 2020, Memorandum (Washington, DC: The Joint Staff, 2013). 6 Richard L. Hughes, Katherine M. Beatty, and David Dinwiddie, Becoming a Strategic Leader: Your Role in Your Organization’s Enduring Success, 2nd ed. (San Francisco: Jossey-Bass, 2014), 11. 7 Linda Robinson et al., Improving Strategic Competence: Lessons from Thirteen Years of War (Santa Monica, CA: RAND, 2014), xi–xii. 8 Richard L. Hughes and Katherine L. Beatty, Becoming a Strategic Leader: Your Role in Your Organization’s Enduring Success, 1st ed. (San Francisco: Jossey-Bass, 2005), 11. 9 Sarah W. Fraser and Trisha Greenhalgh, “Complexity Science: Coping with Complexity: Educating for Capability,”The British Medical Journal 323 (2001), 799. 10 Army Doctrine Publication 6-22, Army Leadership (Fort Eustis, VA: Training and Doctrine Command, 2012). 11 Air Force Core Doctrine, Vol. II, Leadership (Maxwell Air Force Base, AL: USAF Doctrine Center, 2012). 12 Dempsey, America’s Military, 1–6. 13 Joint Publication (JP) 1, Doctrine for the Armed Forces of the United States (Washington, DC: The Joint Staff, March 25, 2013), V-1–V-20. 15 Dempsey, Desired Leader Attributes, 1–2. 17 T. Irene Sanders, Strategic Thinking and the New Science: Planning in the Midst of Chaos Complexity and Change (New York: The Free Press, 1998), 162. 18 Hughes and Beatty, 43–51. 19 Daniel H. McCauley, “An Institution for the Profession of Arms and Thought,” Campaigning, Fall 2014, 7. 20 Edward Cornish, Futuring: The Exploration of the Future (Bethesda, MD: World Future Society, 2004), 1–8. 21 Peter M. Senge, The Fifth Discipline: The Art and Practice of the Learning Organization (New York: Doubleday, 1990), 6, 186. 22 Donella H. Meadows, Thinking in Systems: A Primer (White River Junction, VT: Sustainability Institute, 2008), 11–17. 23 Michel Marie Deza and Elena Deza, Encyclopedia of Distances (New York: Springer, 2009). 24 David H. Jonassen, Learning to Solve Problems: An Instructional Design Guide (New York: Routledge, 2011), 1–3. 25 Tony Buzan, The Mindmap Book: How to Use Radiant Thinking to Maximize Your Brain’s Untapped Potential(London: Penguin Group, 1993). 26 Tom Wujec, “3 Ways the Brain Creates Meaning,” TED Talk, February 2009, available at <www.ted.com/talks/tom_wujec_on_3_ways_the_brain_creates_meaning?language=en>. 29 Peter Checkland, “Soft Systems Methodology: A Thirty Year Retrospective,” Systems Research and Behavioral Science 17, supplement 1 (November 2000), S11–S58. 31 Timothy Stagich, Collaborative Leadership and Global Transformation: Developing Collaborative Leaders and High Synergy Organizations (Miami Beach: Global Leadership Resource, 2001), 1–18. 32 Elizabeth Filippouli, “Cultural Understanding and Global Thinking in Business,” Huffington Post, March 6, 2014. 33 Robert Rosen et al., Global Literacies: Lessons on Business Leadership and National Cultures (New York: Simon & Schuster, 2000), 32–53. 34 Hughes, Beatty, and Dinwiddie, 145–191. 35 Zinni and Koltz, 24–25. From my study of the subject, the chief failing of US military strategy is treating every enemy like the steel pop-ups on the range–assuming that shooting well enough will fix any problem, and that the only difference between enemies is how many rounds it take to knock each target down. That is dreadfully false, but it has been borne out by repeated conflicts where the United States was incredibly proficient at killing the known enemy, but could never convert this killing into a political victory. Efficient strategic victory requires knowing as much about which conditions will influence your enemy as knowing how to actually create those conditions, otherwise you spend the entire war doing something they don’t care about. Book One, Chapter One, Section 21, and Casino Royal (2006), for anyone looking for literature on strategy. Enjoy. This is a serious and insightful analysis. I’m pleased that our military leaders embrace systems thinking at a high level. The challenge seems to be putting those insights into action and achieving our goals.